​Brilliant ink-on-tile illustrations created with a secret process bring the alphabet to colorful life. Children will delight in the rich, poetic language of colors like emerald, jasmine, and quartz—while also meeting old favorites like yellow, orange and purple. Brilliant ink-on-tile illustrations created with a secret process bring the alphabet to colorful life. Children will delight in the rich, poetic language of colors like emerald, jasmine, and quartz—while also meeting old favorites like yellow, orange and purple. A color key and pronunciation guide (for new colors like "zaffre," which rhymes with "laugher") ​is included. in The Tifton Gazette, Tifton GA! By Shelby Evans for the Tifton Gazette. ​Find delightful LITERACY EXTRAS, like these A is for Azure Pronunciation Videos and vibrant reproducibles on Tweetspeak Poetry. You will also meet Molly and Joe for some tongue twisting, early reading fun and games! Rose Marciano says I will probably be ordering more for my grandchildren. 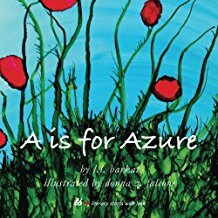 for A is for Azure. "Ooooo. Wow." Elias, 4 years old. From Vicki Adesso: each time I pick up A is for Azure, I am surprised by the magic synchronicity of the language and the images. A beautiful work of art. For its beauty, its invitation to browse again and again, add another category: coffee table book.